In the last couple of years deep learning (DL) has become a main enabler for applications in many domains such as vision, NLP, audio, click stream data etc. Recently researchers started to successfully apply deep learning methods to graph datasets in domains like social networks, recommender systems and biology, where data is inherently structured in a graphical way. In machine learning tasks involving graphical data, we usually want to describe each node in the graph in a way that allows us to feed it into some machine learning algorithm. Without DL, one would have to manually extract features, such as the number of neighbors a node has. But this is a laborious job. The interesting thing is, that even if you have absolutely no information about the nodes, you can still use DL to extract embeddings. The structure of the graph, that is — the connectivity patterns, hold viable information. One well known algorithm that extracts information about entities using context alone is word2vec. The input to word2vec is a set of sentences, and the output is an embedding for each word. 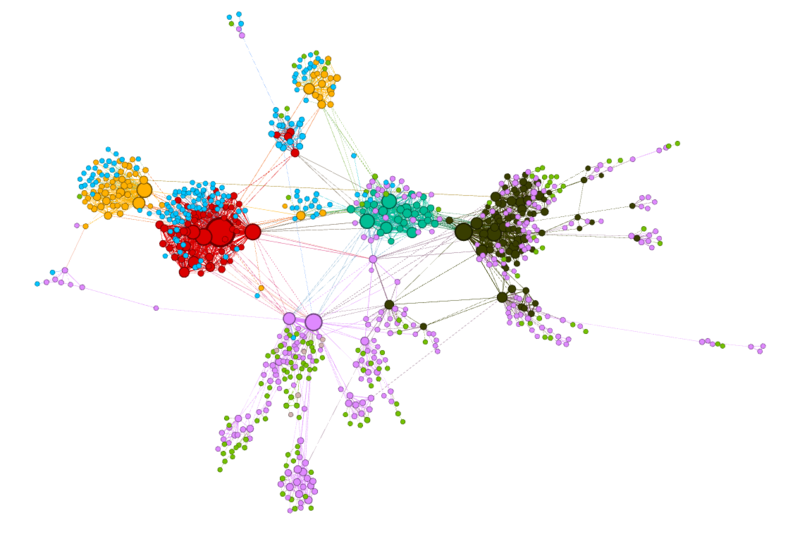 Similarly to the way text describes the context of each word via the words surrounding it, graphs describe the context of each node via neighbor nodes. While in text words appear in linear order, in graphs it’s not the case. There’s no natural order between neighbor nodes. So we can’t use word2vec... Or can we? The key point is to perform random walks in the graph. Each walk starts at a random node, and performs a series of steps, where each step goes to a random neighbor. Each random walk forms a sentence that can be fed into word2vec. This algorithm is called node2vec. There are more details in the process, which you can read about in the original paper. Each article has named entities — the entities described by the title. For example, the item “the cutest dogs on the planet” contains the entities “dog” and “planet”. Each named entity can appear in many different items. Cool! The clusters captured by node2vec seem to be homogeneous. 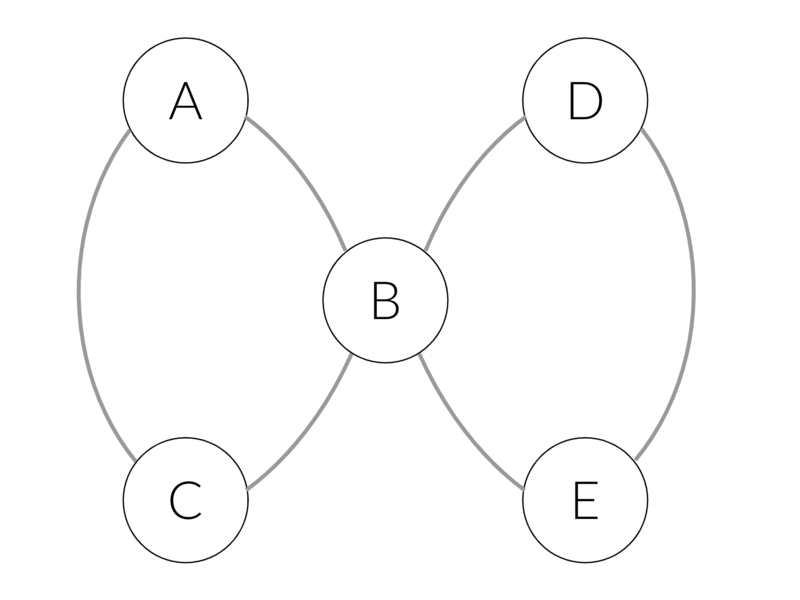 In other words, nodes that are close to each other in the graph are also close to each other in the embedding space. Take for instance the orange cluster — all of its named entities are related to basketball. You might wonder what is the benefit of using node2vec over classical graphical algorithms, such as community detection algorithms (e.g., the Girvan-Newman algorithm). Capturing the community each node belongs to can definitely be done using such algorithms, there’s nothing wrong with it. Actually, that’s exactly feature engineering. And we already know that DL can save you the time of carefully handcrafting such features. So why not enjoy this benefit? We should also keep in mind that node2vec learns high dimensional embeddings. These embeddings are much richer than merely community belonging. Using node2vec in this use case might not be the first idea that comes to mind. One might suggest to simply use word2vec, where each sentence is the sequence of named entities inside a single item. In this approach we don’t treat the data as having a graphical structure. So what’s the difference between this approach — which is valid, and node2vec? 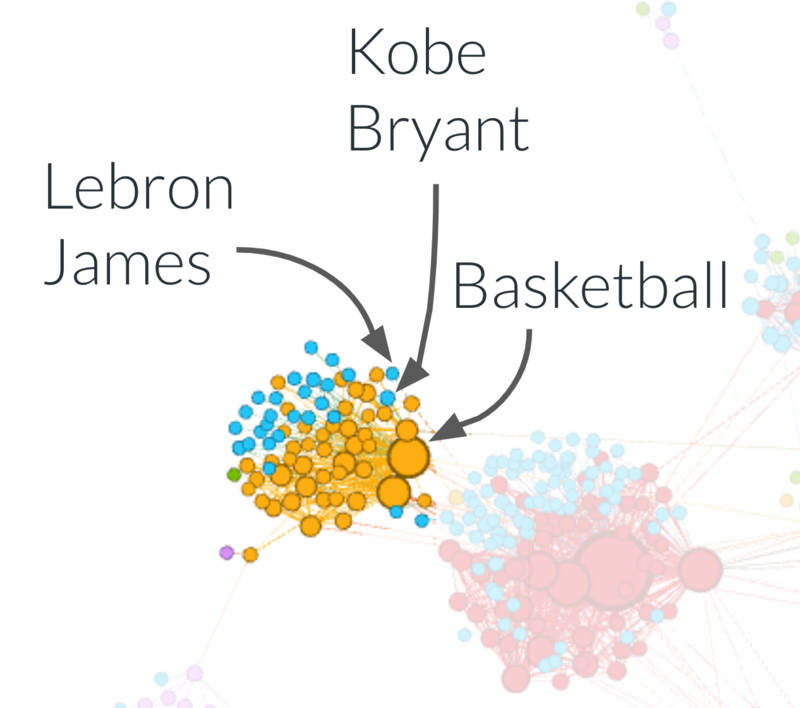 Now the “basketball” cluster is less homogenous — it contains both orange and blue nodes. The named entity “Basketball” for example was colored orange, while the basketball players “Lebron James” and “Kobe Bryant” were colored blue! In this approach each walk in the graph is composed only of named entities that appear together in a single item. It means we are limited to walks that don’t go further than distance 1 from the starting node. In node2vec, we don’t have that limit. In the simple word2vec approach we’ll generate the following sentences: [A, B, C] and [D, B, E]. In the node2vec approach we could also get sentences like [A, B, E]. If we fetch the latter into the training process, we’ll learn that E and C are interchangeable: the prefix [A, B] will be able to predict both C and E. Therefore, C and E will get similar embeddings, and will be clustered together. Using the right data structure to represent your data is important. Each data structure implies a different learning algorithm, or in other words — introduces a different inductive bias. 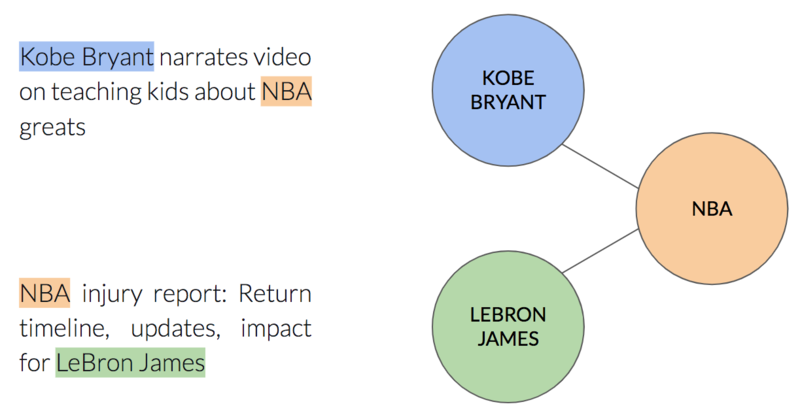 Since so many real world datasets are naturally represented as graphs, we think Graph Neural Networks are a must-have in our tool box as data scientists. Originally published at engineering.taboola.com by me and Zohar Komarovsky.